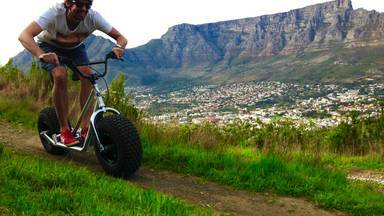 Explore this gem of Stellenbosch on the back a Monster Mountain® Scooter. During the tour you will experience the beauty of these alpine like mountains surrounding Stellenbosch in a fun and active way. Stunning views, majestic mountains and endless downhill slopes is what Scootours® Stellenbosch is all about. WhereTrips depart from Jonkershoek Nature Reserve - there is plenty of parking at the gate as well as a coffee shop.